Annie's Gardening Corner: What’s in Your Dinner Bowl? There’s nothing better than freshness straight from the summer garden. Tomatoes drizzled with olive oil, balsamic vinegar, a dash of salt and pepper with some finely chopped basil is a meal in itself. There are so many creative recipes using your garden produce. What’s in your dinner bowl from this summer’s garden? Need some ideas? Here’s an easy tomato sauce with cooked lentils. Hint: prepare a cup of dry lentils the prior evening (cooked with fresh basil and garlic from the garden) and cooled in the fridge overnight. This means less prep time for this dish because cooking lentils al dente requires a watchful eye. The other items needed: Penne pasta, Romano cheese, and San Marzano tomatoes. 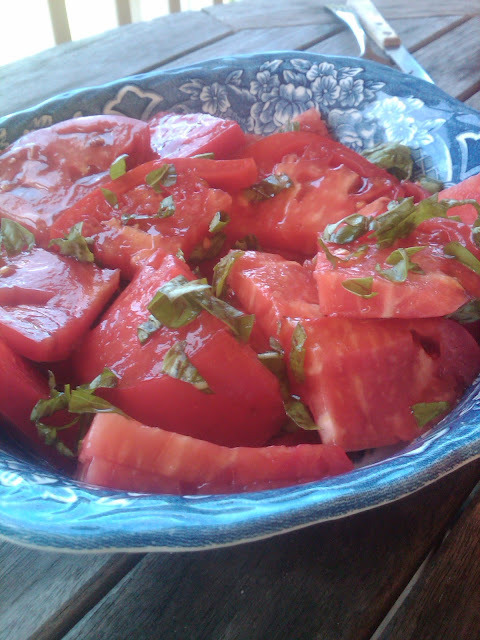 Take four to five ripe tomatoes, sauté in olive oil until the tomatoes are reduced to a paste. Peel off any skins and discard. Add in ½ cup of cooked lentils and simmer until the sauce thickens. Stir in a ½ cup of the pasta water, toss in your cooked Penne and the grated Romano cheese (1/2 to 1 cup) and you have a tasty evening meal. That’s it in a dinner bowl unless you want to enhance it a bit with your own creativity. As Federico Fellini used to say, “Life is a combination of magic and pasta.” Plus fresh ingredients from the garden; it’s the finishing touch!